grandma's cookie jar: Three Day Extension to grandma's cookie jar Cookie Recipe Contest! Three Day Extension to grandma's cookie jar Cookie Recipe Contest! Yes, I'm going to extend the time for submitting and sharing your favorite cookie recipe by three days . . . until October 22, 2017! Then on Monday, October 23, 2017 we will begin the first round of voting for our favorite cookie recipe. So, what is your favorite cookie? Toll House? Peanut Butter? A big Monster Cookie? When you make cookies at your house, what do you bake most often? Oatmeal cookies? Sugar Cookies? Your own special recipe? We will have the opportunity to vote on the recipes submitted and whoever submitted the recipe which receives the most votes will win their own photo cookie jar! If you win, whose photos will you put on your cookie jar? 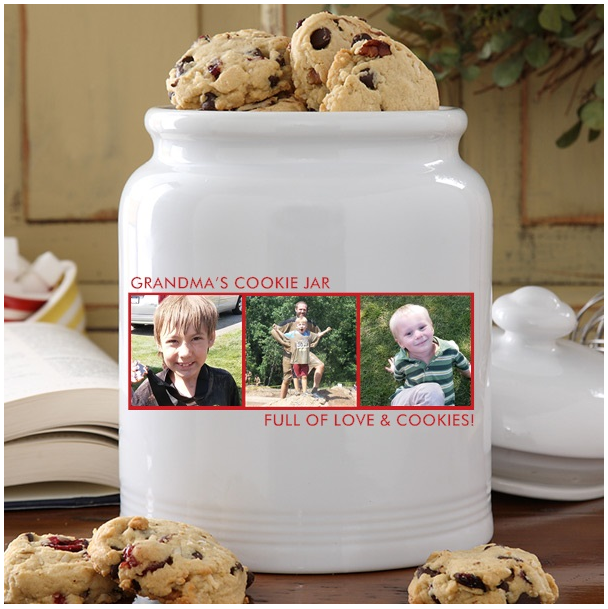 I put my three grandsons on the cookie jar Personalization Mall sent me for review. So, what is your favorite cookie? Peanut Butter Blossom? M&M Cookie? Chocolate No-Bakes? Spritz Cookie? What is your favorite cookie? Please share the recipe for your favorite cookie by posting it in the comments below and Monday we will begin voting to find our favorite cookie recipe! Okay, I am going outside the box on your recipe challenge and am including cookies that are not only suitable for human consumption, but are made for dogs :-) Yes, dog "cookies" :-D Just finished making a batch and decided, "Why not!". Mix all and make into whatever size and shape you wish for your fur babies :-) Bake at 350°F until the moisture has been baked out of them; it is dependent on size really. Stays fresh for two weeks; keep in an air tight container.